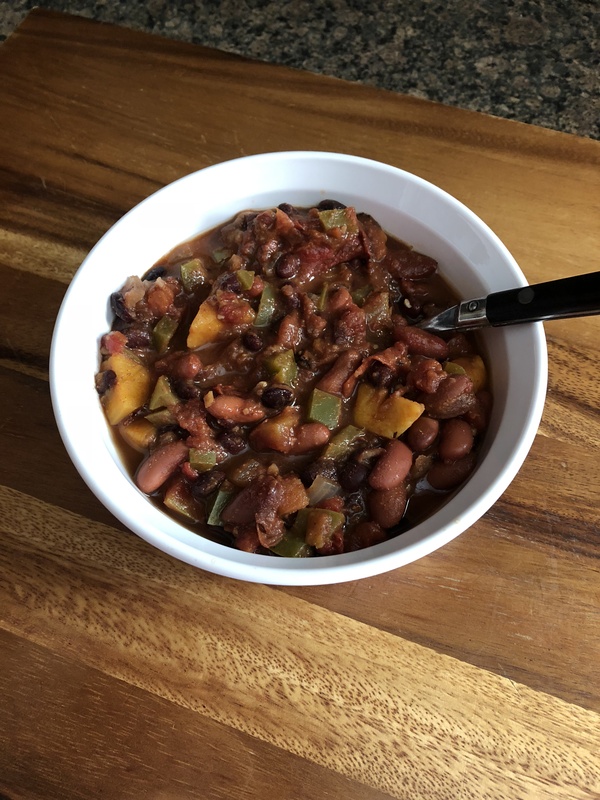 I’ve posted a fair amount of chili recipes and today I am bringing you one more… A Slow Cooker Vegetarian Chili with Sweet Potatoes. This chili is loaded with kidney beans, black beans and chunks of sweet potato. And if you are not keen on spicy chili then this is the chili for you. While I normally do most of my slow cooking on Sunday’s I ended up making this chili in my slow cooker overnight Saturday to Sunday since I had plans to go apple picking on this particular Sunday. I like to be home when my slow cooker is on, I know it’s completely safe and all, but, I just don’t like leaving it unattended. Also, if there happens to be a power outage I can always switch the dish to cook in the oven or on the stove as opposed to my entire meal being ruined because it didn’t cook properly, especially with a meat dish. I once read that if you do leave your slow cooker unattended and there happens to be a power outage and you’re cooking meat the best bet is to toss the food since you can never be sure of bacteria growing. And yes, I know it’s not any safer to have it on while I am sleeping, we can all recall how Jack died on “This Is Us” (even though the slow cooker wasn’t on but had a switch malfunction), in the back of my mind it’s safer thanks to my smoke detector and my keen nose. Speaking of my keen nose, the delicious aromas of this chili woke me prior to the 7-hour cooking mark and I couldn’t go back to sleep, so, I decided to check on it and happily discovered that the sweet potatoes were fork tender so I was able to turn it off and go back to sleep. If it had been on any longer the sweet potatoes would have turned to mush, but, as you can see from the picture below the sweet potato was intact. In the insert of your slow cooker combine the onion, pepper, garlic, chili powder, cumin, cocoa, cinnamon, 1 teaspoon salt and 1/4 teaspoon black pepper. Add the tomatoes (and their juices), beans, sweet potato and 1 cup of water. Cover and cook until the sweet potatoes are tender and the chili has thickened, 7-8 hours on low and 4 to 5 hours on high. Serve with your favorite toppings or eat on its own.